Under the concept of permanent tax planning, Andersen Tax & Legal designs, together with its clients, a tax policy that strives to reduce tax burdens, optimising the strategy and the legal possibilities in each action. In this regard, we have extensive experience in providing advice on all types of tax issues, from general taxation of individuals and legal entities to real estate taxation, tax litigation, financial taxation, international taxation and transfer pricing, restructuring operations, wealth and family business management and indirect taxes. Furthermore, we have a team specialised in tax management and inspection procedures and in resolving disputes through administrative review and administrative law court channels. The professionals forming part of the tax department are also highly specialised in economic sectors (industrial, real estate, financial, energy, health, technology, associations and foundations, sport etc.). From Andersen Tax & Legal, as a member of Andersen Global, we can offer our clients international tax advice of the highest quality. In response to the growing globalisation of the economy and internationalisation of business investments, we offer qualified professional advisory services and an integrated vision of taxation, with the aim of providing our clients with the optimal decision and minimising tax costs and risks, always within the framework of tax legality. These abilities together with teamwork are the key factors that enable us to provide the greatest added value to our advisory services. Advice to expatriate and foreign non-domiciled executives, Spanish investors abroad and foreign investors in Spain. Tax planning in finance structures and repatriation of capital. Analysis and monitoring of developments in EU statute and case law on tax matters. Advice on indirect taxes such as Value Added Tax, Transfer Tax and Stamp Duty, customs and excise duties. Advice on foreign and intra-community trade. Advice on direct and indirect taxation in Spain (Corporation Tax, Income Tax and VAT). Tax planning for domestic and international corporate restructuring operations. Advice in Due Diligence processes. Tax optimization of Spanish investments abroad. Design, preparation and implementation of merger and demerger operations, exchanges of securities and contributions in kind. Advice on tax implications of finance operations and contracts, operations in capital markets and structured finance operations. Design of efficient remuneration systems in terms of accountancy and tax. Tax optimization of intangible assets of business groups. Advice on tax administration, collection, penalty and inspection procedures. Planning of procedural strategy and submissions in relation to tax assessments by the Spanish authorities at national, regional and local level. Preparation and filing of appeals to the tax authorities against tax assessments. Preparation and filing of appeals to the administrative law courts. Representation in proceedings for damages against the public authorities. Analysis of the accounting and tax implications of financial and insurance products. Design of tax-optimised structures to obtain the best returns on investment projects. Tax planning of projects in the renewable energy sector. Related operations in accordance with free market principles. Cost distribution agreements and service contracts. Advice on and monitoring of inspections and appeals to the courts. Monitoring of amicable procedures to avoid international double taxation. A considerable increase in donations is expected, but the main legal and fiscal implications must first be known. Jaime Olleros highlights Álvaro Silva's experience and knowledge, as well as his long career as a lawyer in Andalusia. This new measure aims to ensure equal treatment between traditional and electronic publications. Yago Martos analyzes the continuous modifications of the tax regulations, as well as the changing criteria in their interpretation by the different administrative and judicial bodies. 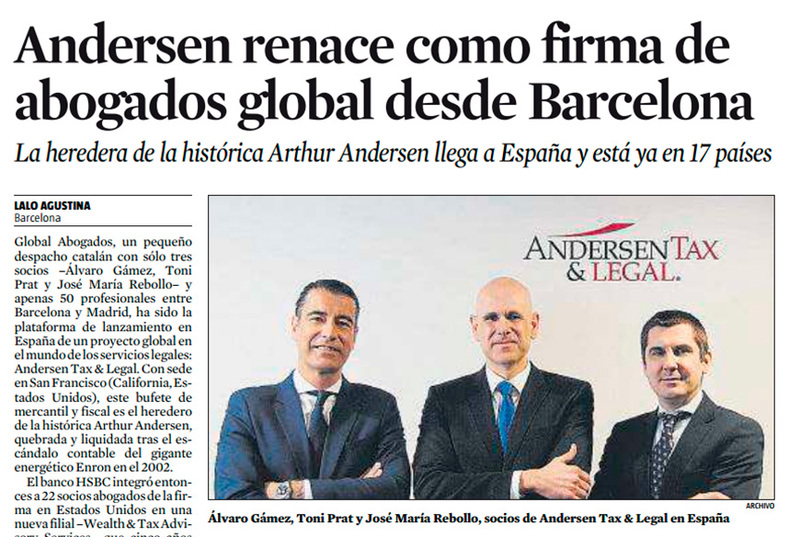 Rodés has proven experience that will be a key asset for the growth and expansion of Andersen Tax & Legal in Spain. La heredera de la histórica Arthur Andersen llega a España y está ya en 17 países.